Chudnite Mostove (The Wonderful Bridges) is a rock phenomenon also known as the Skalnite Mostove (The Rock Bridges). It is situated in the karst valley of the river Erkyupriya in the West Rhodope mountain on 1450 above the sea level, at the foot of Golyam Persenk peak (2091). The rock phenomenon is situated at a distance of 80 km south from Plovdiv, 35 km north-west from Chepelare and only 5 km north-west from the village of Zabardo. The bridges were declared a natural landmark by Decree of the Council of Ministers No 4941 of 18.07.1949. In the past the bridges had been one entire cave, formed under the destructive activity of the river waters. Parts of it were collapsing with time, forming majestic marble bridges. The large bridge is about 15 meters wide in its wider parts and almost 100 meters long. It consists of three arches, as the largest one is 45 meters high and 40 meters wide. The small bridge is at a distance of 200 meters from the large one along the river current. It is impassable, 60 meters long, with total height of 50 meters, and the height of the arch is 30 meters. 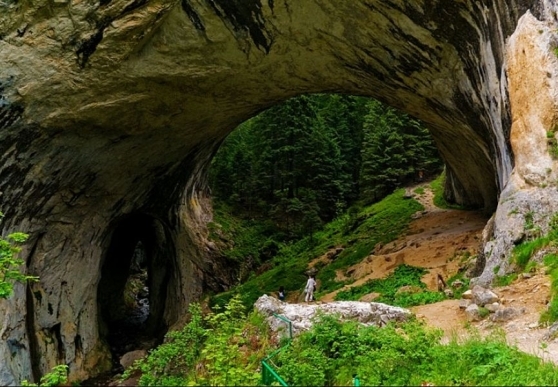 There is also a really small third bridge after it, which is a ponor cave, in which the waters of Erkyupriya river disappear, to appear again on the surface 3 kilometers farther. The dragon swallowed the donkey together with the tinder which was burning slowly but surely. The dragon went crazy and desperately tried to escape, and finally found a small hole in the ground. Its huge body opened the crack. Years later, when the dragon bones decomposed, the large arched bridges remained. This way the Wonderful Bridges appeared according to the legend. The two large bridges are safeguarded and accommodated for the touristic needs. Passing is allowed over and under them. An option for accommodation is offered by the huts situated in close proximity to the sites.